Everyone likes to have a good laugh about the crazy and ridiculous items that are available for purchase in SkyMall, but it had been a while since I'd taken a ride on the bus to crazy-ville. Here we have a piece of stainless steel that somehow acts like deodorant and provides 24 hour protection. You just rub a piece of metal on your armpits while showering and voila! On the very same page, we also have Justin Bieber toothbrushes - so you can listen to the Bieb's greatest hits while brushing your teeth! Yep, that's a 5+ foot tall Velociraptor statue for your yard (or wherever else you'd like to put it). 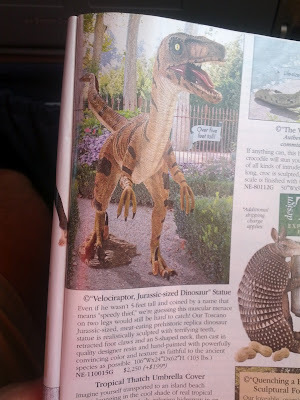 Why anyone would want a near-lifesize statue of a prehistoric predator in their yard is beyond me - but in case you were looking for one, SkyMall's got it! What's the craziest thing you've ever seen (or God forbid, purchased) in a SkyMall catalog? What about the sperm shoes?